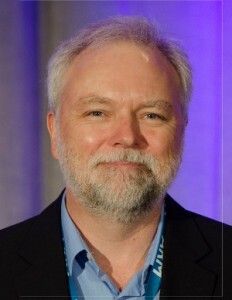 Robert C. Aitken is an ARM Fellow and technology lead for ARM Research. His areas of responsibility include technology roadmapping, library architecture for advanced process nodes, and low power design. His research interests include design for variability, resilient computing, and memory robustness. His group has participated in numerous chip tape-outs, including 8 at or below the 16nm node. He has published over 70 technical papers, on a wide range of topics. Dr. Aitken joined ARM as part of its acquisition of Artisan Components in 2004. Prior to Artisan, he worked at Agilent and HP. He has given tutorials and short courses on several subjects at conferences and universities worldwide. He holds a Ph.D. from McGill University in Canada. Dr. Aitken is an IEEE Fellow, and serves on a number of conference and workshop committees. This entry was posted in Uncategorized by Adrian Evans. Bookmark the permalink.